Providing a player different options of playing a particular shot as well as providing him or her with a variety of required shots, throughout the round, to get close to particular hole locations is the essence of good golf. This involves being able to play along the contour of the ground as well as through the air. 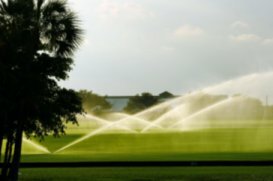 Irrigation of golf courses is likely the most responsible element of modern maintenance practice that has ruined the traditional ground game aspect of golf. Soft putting surfaces, approaches and fairways have resulted in what is commonly known the “American Game” of golf which is played through the air rather than along the ground. I realize poorly draining soil types preclude readily dry conditions in some instances. Therefore, during design and construction all drainage patterns must be analyzed. Proper drainage design and installation (getting surface water underground as soon as possible and providing subsurface drainage to drain the soil profile) along with maintenance practices (such as deep tining and regular aerification of fairways and intermediate roughs) will result in more dry and firmer conditions as well as providing a healthy environment for growing turf. Rather than using irrigation systems as a supplemental source of precipitation, over-watering (and then regular spraying of fungicides) has meant job security to some superintendents – Its not unusual to find casual water in fairways in the middle of August in Indiana when it has not rained for several weeks. It seems in the last few years more superintendents are beginning to live on the edge a little more – bentgrass thrives when it is a little hungry and a little thirsty. Irrigation systems, grass selelction and maintenance pratices must be integrated in the design process. Irrigated roughs, in Indiana, are typically seeded with a bluegrass/ryegrass blend. Mowing patterns should provide an intermediate cut of rough directly adjacent to the fairway of at least ten feet (which can be easily reduced to six feet for competition). In areas outside of irrigation a mixture of fescues, with some ryegrass for establisment, is used to hold up as well as possible during dry conditions. As fescues do not hold up well to traffic, traffic patterns must analyzed and controlled to minimize potential damage.